On June 14, 2013, Lindsay Knauf takes a picture of a bus bearing some of the over 6,000 names of people killed by gun violence since the mass shooting at Sandy Hook Elementary School in Newtown, Connecticut, at a remembrance event on the six-month anniversary of the massacre. Gun control advocates had hoped the Dec. 14, 2012, mass shooting at Sandy Hook Elementary School in Newtown, Connecticut, would spark a movement for stricter gun laws. 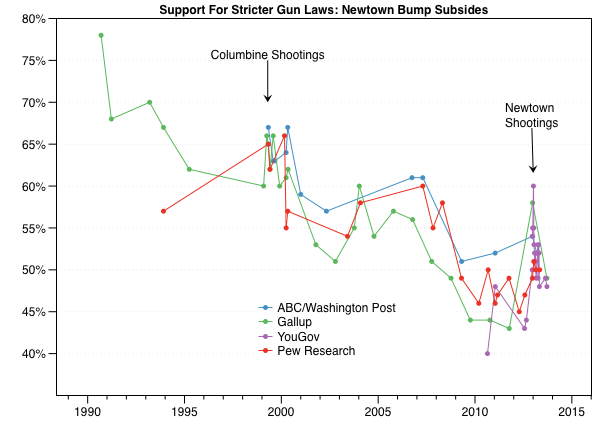 And support for gun control did initially rise. But as we approach the two-year anniversary of the massacre, it’s support for gun rights that is at an all-time high. According to a Pew Research Center report published Wednesday, 52 percent of Americans think it is more important to “protect the right of Americans to own guns” than it is to “control gun ownership.” As the media has lost interest in gun issues, public opinion has reverted to its previous trend. The absolute value of the correlation is 0.8 for both news mentions of gun control, as measured by the NewsBank archive, and Pew questions on gun control. Leading up to the Sandy Hook shooting, there were usually less than 2,000 “gun control” mentions per month. 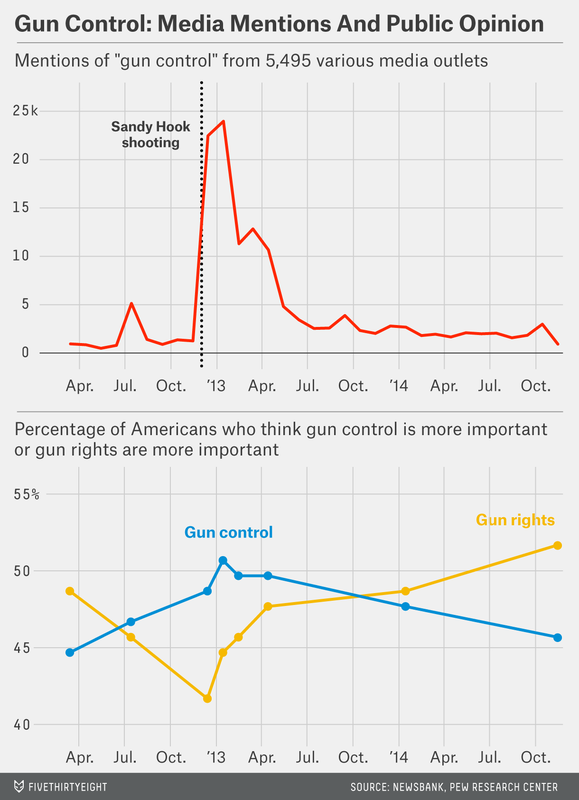 At that time, support for gun control stayed below 50 percent. In the month after the Sandy Hook massacre, there were more than 20,000 mentions of “gun control” by news outlets, and support for gun control spiked at 51 percent in the Pew poll. In each of the five months after the shooting, there were more than 10,000 mentions by the media, and support for gun control stayed at 50 percent. But after the Senate failed to pass a bill promising universal background checks in April 2013, the media lost interest. Since then, monthly media mentions of “gun control” have never topped 5,000, and support for gun control has dropped below 50 percent again. In the past month, “gun control” has been used in the media just 921 times, according to NewsBank. And the new Pew survey was the first in decades to find a majority of respondents favored gun rights over gun control.